Researchers have shown that they can detect tiny, misfolded protein fragments in cerebrospinal fluid taken from patients. Such fragments have been suggested to be the main culprit in Alzheimer's disease. The findings reported in the Cell Press journal Cell Reports lend hope that doctors might soon have a way to diagnose the disease while treatments might have a better chance of working—that is, before extensive brain damage and dementia set in. Scientists used to think amyloid plaques were the problem in Alzheimer's disease.
" Now it seems clear that the aggregates are not the main culprits, it's their precursors," so-called Aβ oligomers, said Dr. Claudio Soto of the Department of Neurology at the University of Texas Medical School at Houston. 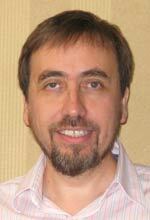 "This is the key molecule and could be the best, most reliable way to make an early diagnosis. 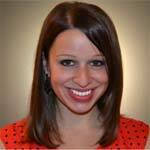 That's been the biggest problem in the field: you can't identify patients until they are already sick." "Those Aβ oligomers may be circulating in the body years if not decades before cognitive symptoms arise," he added. If only there were a way to detect them. In the new study, Dr. Soto and his colleagues applied a technology they developed earlier for detection of the misfolded proteins responsible for prion diseases including mad cow disease. Their protein misfolding cyclic amplification (PMCA) technology works by amplifying existing misfolded proteins and then breaking them up into smaller pieces. When mixed with the equivalent, normal protein, the misfolded fragments act as seeds for the formation, in the case of Aβ, of amyloid clumps like those found in the Alzheimer's brain. The researchers showed that their PMCA technology can detect Aβ oligomers at incredibly low concentrations. In principle, their earlier prion work suggests it might be possible to detect even a single particle of misfolded Aβ. Most importantly, Soto and his colleagues were able to distinguish between patients with Alzheimer's disease and those with other neurodegenerative or neurological disorders with 90% sensitivity and 92% specificity by applying their test to cerebrospinal fluid samples. The next step, Dr. Soto said, is to adapt the technology for use with blood or urine samples, which would be much easier to obtain for screening perfectly healthy people for biochemical signs of Alzheimer's disease. They will also continue to explore its utility for detecting the disease before symptoms appear. If additional research can confirm the utility of the test in Alzheimer's and perhaps other conditions (e.g., Parkinson's disease), Soto says an FDA-approved test could be on the market in as little as three years. His team is already involved in commercializing the PCMA technology for application in prion diseases. 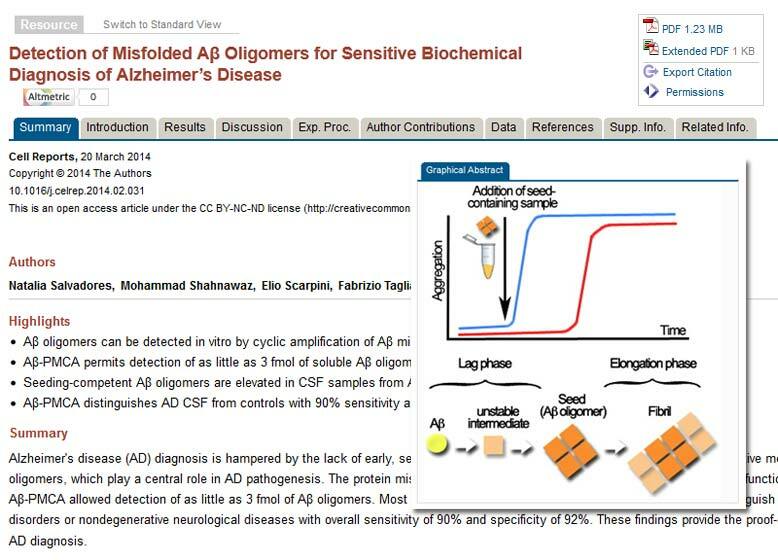 The article is freely available on the Cell Press website and ScienceDirect for two months, until May 20, 2014: Cell Reports, Salvadores et al: "Detection of Misfolded A Oligomers for Sensitive Biochemical Diagnosis of Alzheimer's Disease."